“Rage Against the Regime: Educating Children About ‘President’ Trump” (paper). TBA (plenary & two interactive workshops). “What’d I Miss? 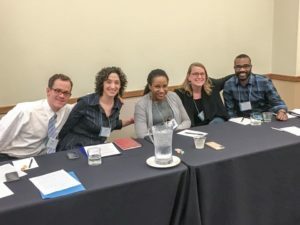 : Learning from Archival Silences in Children’s Literature Scholarship.” Paper on “Voices from the archive: Excavating the silences in the history of children’s literature” panel, which includes papers from Nina Christensen, Karen Sánchez-Eppler, and Nazera Wright. “Why Adults Refuse to Admit Racist Content in the Children’s Books They Love,” 4 pm. “A Manifesto for Radical Children’s Literature (and an Argument Against Radical Aesthetics)” (invited talk). Fri., Nov. 16, 11:30 am to 12:15 pm. The Auditorium, Manne Siegbahn Building, Frescativägen 24E, Campus Frescati. American Studies Association, Atlanta, Georgia, U.S.A.
“Children’s Literature and Emergent Genealogies of Resistance” (chair of & respondent to panel, featuring Breanna McDaniel on “How It Went Down, How We Rise Up: Surveillance, Resistance and Black Lives Matter YA,” Nadia Mansour on “We Need Diverse Danes: How Children’s Books Are Bringing Multiculturalism to Denmark,” and Catherine Keyser on “Chew on This: Global Food and Children’s Literature”). Thur., 8 Nov., 10:00 to 11:45 am, Westin Peachtree, Sixth, Chastain 2. “Business Meeting: Childhood and Youth Studies Caucus.” Sat., Nov. 10, 10:00 to 11:45 am, Westin Peachtree, Ninth, Savannah E.
“Why Adults Refuse to Admit Racist Content in the Children’s Books They Love” (keynote). 10:10-10:55 am. DOKK1. “Reading the Comments Section; or, Why Adults Refuse to Admit Racist Content in the Children’s Books They Love” (conference paper). This is part of the panel “All Necks Are on the Line: Decentering Whiteness, Memory, and Nostalgia in Children’s and Young Adult Literature,” featuring Katharine Capshaw on “Why We Love The Snowy Day: Whiteness and Historical Memory” and Althea Tait on “Risky Business: Reading African American Children’s and Young Adult Literature With an Aesthetic of Empathy.” Session 11H, 3:30 pm. “How children’s picture books work: Harold (or Paultje), a Purple Crayon, and the Making of a Children’s Classic” (invited talk). 7:00-8:30 pm. Modern Language Association, New York City, U.S.A. I had far more good abstracts than I did slots on the panel. So, apologies to all I had to turn down. (There were 36 submissions from a total of 10 countries, including the US, Norway, UK, Australia, Canada, Denmark, France, India, Japan, and Poland.) The panel description (below) offers the rationale for this particular configuration of ideas and experts. Because books can encourage children to question rather than accept the world as it is, this session (sponsored by the Children’s Literature Forum) examines children’s literature as a vehicle for social change. How can we raise a new generation less susceptible to the follies that created our current predicament? To address that question, first, the panel offers historical and geographical breadth in both subject matter and country of scholars. In thinking about resistance today, we need to be thinking historically and internationally. Second, the panel covers key areas under attack by Trumpism and its various fascist affiliates: the Enlightenment project itself (Appel & Christensen, covering 18th and 19th century Denmark), the efforts to forge a multi-racial struggle against racism (Fielder, 19th century U.S.), the fight for LGBTQ rights (Matos), and the very possibility of resistance itself (Willis). Third, the order of panelists offers a roughly chronological progression through history and subject matter, concluding with Willis’s paper, not just because it questions the panel’s “Harry Potter” metaphor but also because it functions as a kind of meta-commentary on the panel itself. American Studies Association, Chicago, Illinois, U.S.A.
“Children of the World, Unite! : Respecting Difference and Building Community Through Books for Young People.” Paper on the panel “Against Nationalism: Children’s Literature and Pedagogies of Resistance,” which features papers by Brigitte Fielder, Lara Saguisag, and response from Mary Niall Mitchell. Fri., 10 Nov., 4:00-5:45 pm, Hyatt Regency Chicago, Skyway 260, Skyway Level East Tower. “Business Meeting: Childhood and Youth Studies Caucus.” Sat., 11 Nov., 2:00 to 3:45 pm, Hyatt Regency Chicago, Picasso, Concourse Level West Tower. Oxford University Press, New York, NY, U.S.A.
“Was the Cat in the Hat Black? : The Hidden Racism of Children’s Literature and the Need for Diverse Books.” 12:00-1:00 pm, High Line Mezzanine Conference Room. Third International Congress of Reading, Pontificia Universidad Católica de Chile, Santiago, Chile. “Was the Cat in the Hat Black? : The Hidden Racism of Children’s Literature and the Need for Diverse Books.” Keynote. 9:30 am. “The Impossibility of an International Keywords for Children’s Literature” (panel co-chair and co-organizer, with Lissa Paul), featuring panelists Victoria Ford Smith (“Adult”), Lies Wesseling (“Family”), Nicole Markotic (“Disability”), and Derritt Mason (“Trans”). 10 am. Talks at Google. Mountain View, CA. “Was the Cat in the Hat Black? 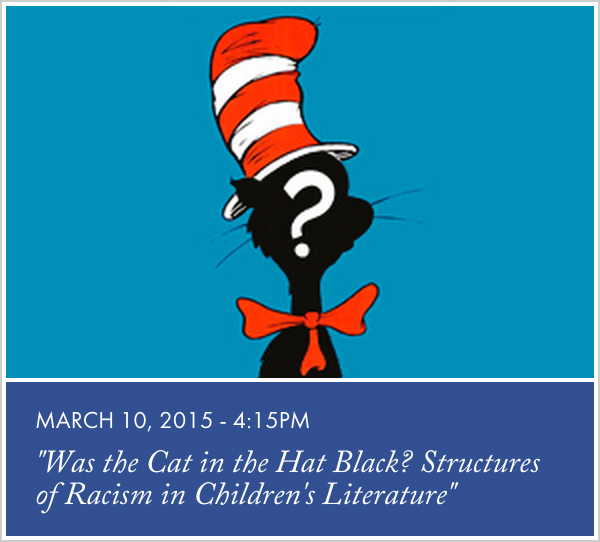 : The Hidden Racism of Children’s Literature, and the Need for Diverse Books.” 12:30 pm. Children’s Literature Association Conference, Tampa, Florida, U.S.A.
“Imagining the Future of Keywords for Children’s Literature” (panel co-chair and co-organizer, with Lissa Paul), featuring panelists Zoe Jaques (“Posthuman”), Ebony Elizabeth Thomas (“Diversity”), Michelle Martin (“Diaspora”), and Naomi Hamer (“Media”). 3:30-4:45 pm, Palma Ceia 3. “The Unbearable Whiteness of Nostalgia: Technology, Racial Erasures, and William Joyce’s Fantastic Flying Books.” Keynote. “How to Read Harold: a Purple Crayon, Crockett Johnson, and the Making of a Children’s Classic.” Keynote. 10:00 am, room G06. “Was the Cat in the Hat Black? : The Hidden Racism of Children’s Literature, and the Need for Diverse Books.” Faculty of Education, University of Cambridge, May 9, 5-6:30 pm, room G06. 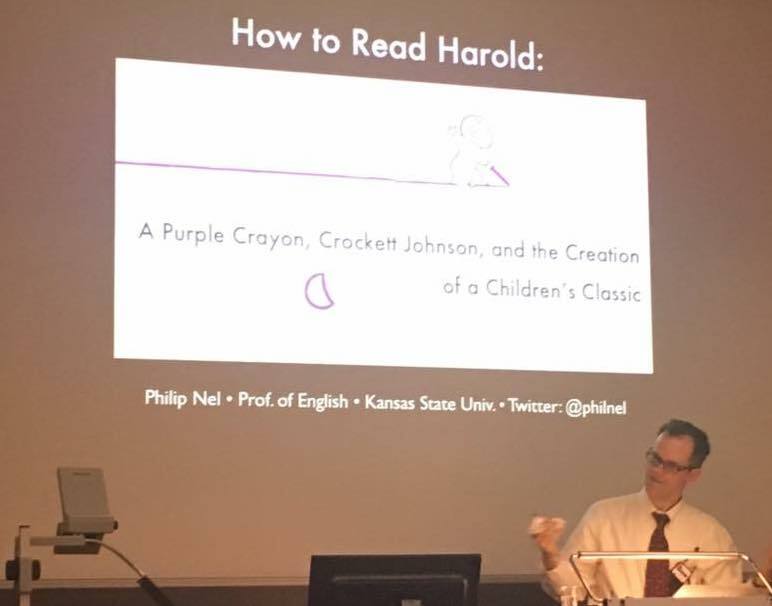 “How to Read Harold: a Purple Crayon, Crockett Johnson, and the Making of a Children’s Classic.” Keynote. “Border Conflicts: Migration, Refugees, and Diaspora in Children’s Literature.” With Nina Christensen, co-organizer and co-chair of panel, featuring papers by Lee A. Talley, Carmen Nolte-Odhiambo, and Anastasia Ulanowicz. 1:45–3:00 p.m., Franklin 13, Philadelphia Marriott. “Desegregating the Imagination: A Manifesto for Anti-Racist Children’s Literature.” Paper on the panel, “Home White Home: Childhood and the Racial Imagination,” featuring papers by Anna Mae Duane, Beth Marshall, Michelle Martin, and response from Lara Saguisag. 10:00 to 11:45am, Denver Convention Center, Level 3, Mineral Hall G.
“Where American Studies is at Home/not Home: Working in Different Disciplinary and Professional Contexts” (roundtable discussion). Panelist, with Nicole Hodges Persley, Mark Metzler Sawin, Stewart Varner, Patricia Sawin. 4:00 to 5:45 pm, Denver Convention Center, Level 3, Mineral Hall B. “How to Read Harold: Crockett Johnson, a Purple Crayon, and the Making of a Children’s Classic.” Keynote. 9:00am. University Library, room 330. “Crockett Johnson’s Barnaby: What Makes a Great Comic Strip.” Panelist, with Jeff Smith & Eric Reynolds. 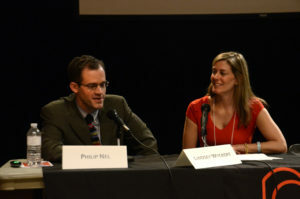 Moderator: Tom Spurgeon. 4:00-5:00 pm. Room 29AB. Official description: “Before Calvin and Hobbes, Peanuts, and Pogo, there was Barnaby. Crockett Johnson’s classic strip combined fantasy and satire, a child’s feeling of wonder and an adult’s wariness, with highly literate jokes and a keen eye for the ridiculous. 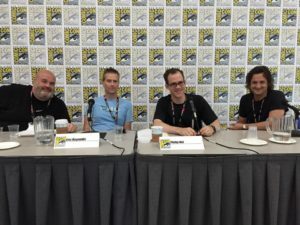 Johnson’s biographer Philip Nel is joined by Eric Reynolds, co-editor of Fantagraphics’s Barnaby series, cartoonist Jeff Smith (Bone), and moderator Thomas Spurgeon (The Comics Reporter). They’ll talk about why the strip remains so influential and its place in the history of great American comics.” Click here for other Fantagraphics panels. Click here for full program schedule. “Animating Factors in Radical Children’s Literature.” I’m chairing this session, which features Kimberley Reynolds, Katharine Capshaw, Julia Mickenberg. (But all credit to the panelists for organizing it! I’m merely the chair.) 9 June 2016, 2 pm. Room: Judicial. “Crockett Johnson’s Careful Satire: Barnaby Meets the Cold War, 1948-1949.” Part of a panel titled “Juxtaposed Ideologies in Deliberate Sequence: 20th-Century American Comics Get Political,” chaired by Charles Hatfield, and featuring fellow panelists Lara Saguisag and Susan Honeyman. 10 June 2016, 5:00 pm. Room: Judicial. “Drawing Lessons: Harold, a Purple Crayon, and Creative Play in Postwar America.” 4:10 pm. Faculty of Law, Administration and Economics, Building D, ul. Uniwersytecka 7/10. Room 2.04D. “Was the Cat in the Hat Black? : The Hidden Racism of Children’s Literature, and the Need for Diverse Books.” 8 pm. More information here. “Crockett Johnson and Ruth Krauss: How an Unlikely Couple Found Love, Dodged the FBI, and Transformed Children’s Literature.” S. Dillon Ripley Center, Smithsonian Institution, Washington, DC. 6:45-8:45 pm. More information and tickets here. “Children’s Literature Scholarship and Its Publics” (panel chair and organizer). Discussion featuring Julie Walker Danielson, Marah Gubar, Don Tate, and Ebony Elizabeth Thomas. 8 January 2016, 12:00 noon-1:15 p.m.
“The Weird, the Wild, the Wonderful: A Cross-Cultural Look at Normality in Children’s Literature.” Paper, co-presented (and co-written) with Nina Christensen. On “Keep Children’s Literature Weird” panel organized by Karen Coats. 9 January 2016, 8:30-9:45 am. “Hurricane Katrina, Racial Invisibility, and Fantastic Flying Books: The Aestheticization of Misery in William Joyce.” Paper on “Sad Children: Social Misery in the Real and Imagined Spaces of Childhood” panel, featuring papers by Natalia Cecire, Anna Mae Duane, and Beth Marshall, plus a response by Lucia Hodgson. 10 am. “Childhoods ‘outside the boundaries of imagination’: Race, Genre, and the Segregation of African American Children’s Literature.” Paper. 11:30 am. As the announcement says, “In August 2015 the Children’s Literature Unit in the School of English at Newcastle University will be hosting a series of children’s literature Master Classes concentrated in two days. The classes will be led by a distinguished, international team of children’s literature scholars. The overall subject will be ‘The Future of the Subject’, with a particular focus on Archives.” The team includes me (obviously), Kim Reynolds, Kate Capshaw, Matthew Grenby, Kenneth Kidd, Bettina Kümmerling-Meibauer, Anja Müller, and others. Registration is free; lodging is not. For more details, click on the pdf. Deadline to apply is 31 May 2015. “Dr. Seuss, American Icon: The Legacy of Theodor Seuss Geisel.” 6:45-8:45 pm. More information on this “Evening Program with Light Reception” can be found at the Smithsonian Associates’ page. “Is This 2015 or 1965? : Structures of Racism in Children’s Literature” (paper). Panel features papers by Giselle Anatol, Melissa Hayes, and Jani Barker. 18 June, 11:00 am. “Tales of Power and Independence: Liberating Legacies of Gianna Rodari, 1920-1980” (chair of panel). Panel features papers by Judith Plotz, Jack Zipes, Marina Balina, and Claudia Alborghetti. 20 June, 11:15 am. “Was the Cat in the Hat Black? : Structures of Racism in Children’s Literature.” Keynote. 4:15 pm, Watson Forum. Also, come and hear the great Michelle Martin’s talk, “From the Kitchen to the Edges: Hair Representations in African American Children’s Picture Books,” at 7:30 pm in Prindle Auditorium. Both talks are free and open to the public! Round table session on three SP/ACA Rollins Award Winners: my Crockett Johnson and Ruth Krauss: How an Unlikely Couple Found Love, Dodged the FBI, and Transformed Children’s Literature, Kimberley Monteyne’s Hip Hop on Film: Performance Culture, Urban Space, and Genre Transformation in the 1980s, and Justin S. Vaughn and Lilly J. Goren’s Women and the White House: Gender, Popular Culture, and Presidential Politics. 9:45 am – 11:15 am, Sendero II. I’m told there will be a book-signing afterwards. “How to Read Uncomfortably: Affect, Power, and Resisting Racist Children’s Books.” 12:00 pm, Westin Bonaventure, San Gabriel C (L1). “Crockett Johnson and Ruth Krauss: How an Unlikely Couple Found Love, Dodged the FBI, and Transformed Children’s Literature.” 7:30 pm, Rowayton Community Center, 33 Highland Ave., Rowayton. “Not So Simple: The Genius of Crockett Johnson’s Harold and the Purple Crayon.” 4:00 pm, Co-op Bookstore at Storrs Center. 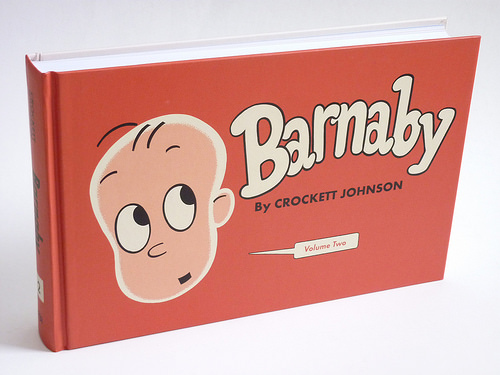 I’ll be at the Fantagraphics booth (#1718), signing Barnaby books (which I co-edited with Eric Reynolds). Currently available: Barnaby Volume One: 1942-1943 (2013) and Barnaby Volume Two: 1944-1945 (2014). Stop on by, even if it’s just to say hi! Oh, and click here for full schedule of Fantagraphics authors & editors. “What We Talk About When We Talk About Race: Affect, Racism, and Classic Children’s Books” (paper). 11 a.m.
“Dreaming in Red: Russia and the Soviet Union in Anglo-American Children’s Literature, 1905-1945” (chair of panel, featuring panelists Julia Mickenberg, Kim Reynolds, and Jane Rosen). June 20, 11 a.m.
“Teaching Racist Children’s Books; or, How and Why to Make Readers Uneasy” (paper). June 21, 9:45 a.m.
“Fighting for Freedom of Speech: The First Amendment Under Attack.” 3:30 pm, Alderson Auditorium, Kansas Union. “The Queer Case against Willa Cather’s Paul,” Adam Sonstegard, Cleveland State Univ. 12:00 noon, Chicago F, Chicago Marriott. “Laughing from the Left: Crockett Johnson’s Barnaby, and the Limits of Satire as a Means of Dissent” (paper, on panel “When Does Laughter Liberate? : Humor and Dissent in 20th-Century Popular Culture,” which features papers by Juniper Ellis, Gary Richards, and a response from Lori Brooks). 8:00 am, Washington Hilton / A – Albright. University of Tennessee at Knoxville. 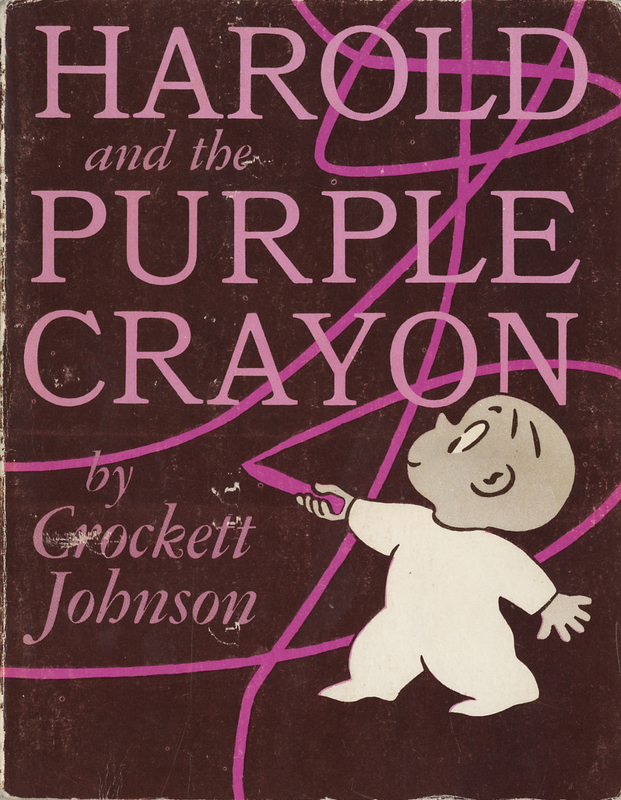 “Not So Simple: The Genius of Crockett Johnson’s Harold and the Purple Crayon” (invited talk). Oct. 24, 3:30 pm. “Was the Cat in the Hat Black? : Seuss and Race in the 1950s” (seminar). Oct. 25, 12:00 pm. 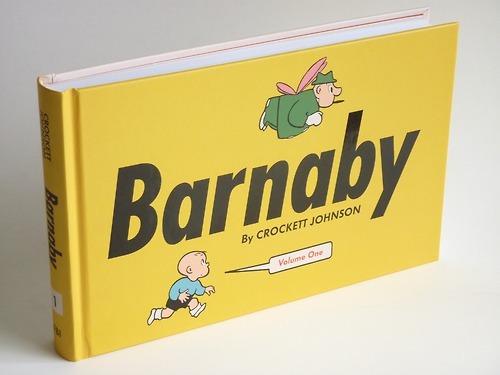 “Crockett Johnson’s Barnaby: The Greatest Comic Strip You’ve Never Read” (invited talk). 8:00 pm, Parsons School (2 West 13th Street), in the Bark Room (off the lobby). Free and open to the public. “Ruth Krauss, Crockett Johnson, and Other Little Rebels: Philip Nel in conversation with Lindsey Wyckoff.” 9:35 am, Auditorium. “Whiteness, Nostalgia, and Fantastic Flying Books: The Disappearance of Race in William Joyce” (paper). 12 Aug. 2013. “Keywords for Children’s Literature: A Roundtable Discussion”: panel session co-chaired with Lissa Paul, and featuring Nina Alonso, Nina Christensen, Francesca Orestano, Emer O’Sullivan. 13 Aug. 2013. “‘He came up thinking fast’; or, How does Crockett Johnson’s Harold and the Purple Crayon work” (invited). “Manifesto for a Comics-Children’s Literature Alliance” (as part of a panel titled “Taking a Risk: Manifestos for Children’s Literature,” which also features manifestos from Robin Bernstein, Marah Gubar, and Karin Westman). “Getting a Race-Lift: Whitewashing, Marketing, and Resistance in Children’s Literature” (as part of a panel session titled “Black, White, or Other? : Reading Race, Constructing Childhood in American Popular Culture”). 10:00 am, Puerto Rico Convention Center, 101A. “Crockett Johnson and Ruth Krauss: How an Unlikely Couple Found Love, Dodged the FBI, and Transformed Children’s Literature.” 2 p.m., Stephen A. Schwarzman Building, South Court Auditorium. 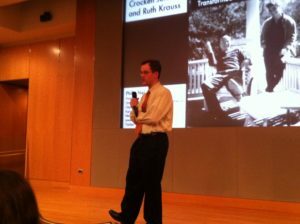 “Surrealism for Children: Paradoxes and Possibilities” (invited talk). 2 pm. 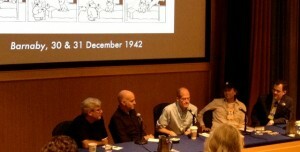 “Crockett Johnson’s Barnaby and the American Clear Line School” (panelist), with Daniel Clowes, Mark Newgarden, and Chris Ware. 12 pm, White Flint Auditorium. “Comics as Children’s Literature” (moderator). Panel features Renée French, Françoise Mouly, Mark Newgarden, and Brian Ralph. 5 pm, White Flint Auditorium. “Keywords for Children’s Literature: Mapping the Critical Moment” (keynote), with Lissa Paul. “Don’t Judge a Book by Its Color: Whitewashing, Race, and Resistance” (as part of a panel session, “Slipstreams of Race: Whiteness and Children’s Literature”). “Crockett Johnson and Ruth Krauss: How an Unlikely Couple Found Love, Dodged the FBI, and Transformed Children’s Literature.” Lois Lenski Lecture. 7 p.m., 138 Schroeder Hall. Free and open to the public. “Harry Potter: A Cultural Biography.” 1:30 pm, 501 Cathedral of Learning. “Not Genres, but Modes of Graphic Narrative: Comics and Picture Books” (as part of a panel session on “Why Comics Are and Are Not Picture Books”). 5:15 p.m., 303 Washington State Convention Center. “Filling the Gaps: The Future of Keywords for Children’s Literature”: panel session co-chaired with Lissa Paul, and featuring Jack Zipes (on “Fairy Tale”), Karin Westman (on “Genre”), and Kelly Hager and Talia C. Schaffer (on “Family”). 1:45 p.m., 205 Washington State Convention Center. “Accidental Experts: Strategy, Serendipity, and the Places You’ll Go,” with Karin Westman. 2:10-3:45 p.m. Buttrick Hall 309. “Keywords for Children’s Literature,” with Lissa Paul. (Lissa will be there, physically; I’ll be participating via Skype.) 5:00-7:30 pm GMT. East Road, Lord Ashcroft Building, LAB 107. “Re-Imagining America: Jeff Smith, Herman Melville, and American Dreamscapes,” co-presented with Jennifer A. Hughes (as part of a panel session on “Transforming Melville”), 8 a.m., Hilton Baltimore: Douglass. “Erasing Race to Keep Kids Safe? : The Ideological Effects of Bowdlerizing Children’s Literature” (second paper on panel session), 5 p.m., room Z306. “Radical Children’s Literature Now!” (keynote), co-presented with Julia Mickenberg. 10 a.m., Babcock Auditorium, Dana. “The Hope in the Joke: The Politics of Laughter in Dr. Seuss” (as part of a panel on “Laughing at Power: Subversive Humor in American Visual Culture”), 12:00 p.m., Grand Hyatt: Presidio C.
“Q&A,” 3:30 p.m., Wilson Lecture Hall. “Harry Potter: A Cultural Biography,” 7 p.m., Wilson Lecture Hall. “Dr. Seuss, American Icon: The Legacy of Theodor Seuss Geisel,” 7 p.m., Park Library Auditorium. Older Invited Talks and Conference Papers are listed on my CV.